Hide 50 comments... Click to show. lol, how's it been? You hear from the admins? I'm doing well. How are you? I have not heard from any of the admins at all. Unfortunately, the future of FanUp isn't looking too bright. Just got to keep our hopes up though. Congrats on the weekly again! wow, i won?!?! I was gonna post another guide that I wrote, but it was too late. but i guess i won anyways!! Never thought you never knew you won. Anyways congrats! oh thx for clearing that up! Congrats on the weekly Blockbolt! Congrats on the weekly mate! Hey i like the way you have been participating these days in the weekly contest. I like your guides and your style. Keep going and Fanupping! I feel sorry for you many guides .no win. try the next week. Hope I win the weekly! No I am sry but I an a guardian and not an Admin and only and only the admin has the right to approve guieds! which server do you play on? Minecraft? Mate you need to have the Master Guide Smith batch for inserting pictures in between you guides. This batch can be earned by being consistent in your weekly participation and showing your creativeness and length etc.. In your guide. Once the mods think you deserve it you will be automatically awarded! So for now you can only insert one image! Hey! Welcome to Fanup If you have problem regarding anything please feel free to contact me @Fanup Guardian Nice to see you! 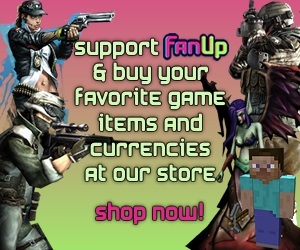 Welcome to FanUp.Best community for gamers.Hope you have a nice time here.! U got some funny pics! I loled at all of them. If you know alot about TF2, you could write about it, and could also earn FanBucks through the weekly contest by doing so. How is this red o.o? thank you goku! I really hope I win cause I love gaming and would love to buy my friend a minecraft gift code!